On 29th May 2017 Spotify updated authentication specifications for their API. We updated the tutorial and added support for OAuth2 authentication. Official Statement.. The Spotify tutorial will use the powerful HTTPClient class to perform REST queries to the Spotify API. You will learn how to interact with a REST service to perform queries based on user's input. Spotify Web API Developer official documentation. You can also create your own custom view template. But for this example we will not do that. The Subtitle template gives an Image, a Title and a Subtitle field. 3 Spotify's docs state that its REST API endpoint is 'api.spotify.com'. Enter that in the HTTPClient config panel. It's good practice to rename the object HTTPClient1 in the Layout section with a more appropriate name. 5 Setup Redirect URIs and Bundle IDs and you'll receive a Client ID and a Client Secret. 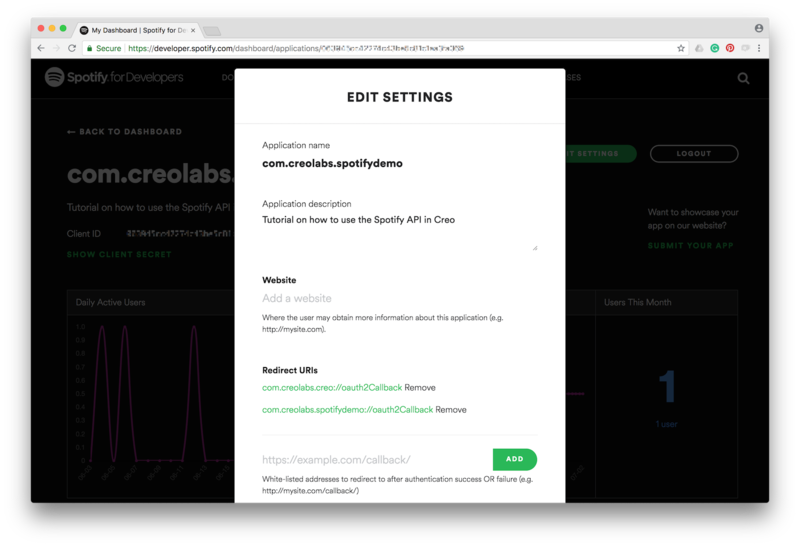 Two different Redirect URI are needed: one custom Redirect URI specific for your App (in this example: "com.creolabs.spotifydemo://oauth2Callback") that is used when the App runs in a real device and the Creo default redirect URI "com.creolabs.creo://oauth2Callback" used to be able to test the App in the Creo simulator within the Mac IDE and in the CreoPlayer. 9 We want to create an app that lets you search for albums based on artist's name. So the right Spotify API to use seems to be the Search Item API. It requires two parameters, a mandatory type parameter (that can be album, artist, playlist or track) and a q parameter (the search keyword). To test our HTTPRequest enter the query v1/search/?q=adele&type=album in the Request field. You can notice under the Query section that Creo automatically parsed that query and creates dynamically properties that we'll use later. 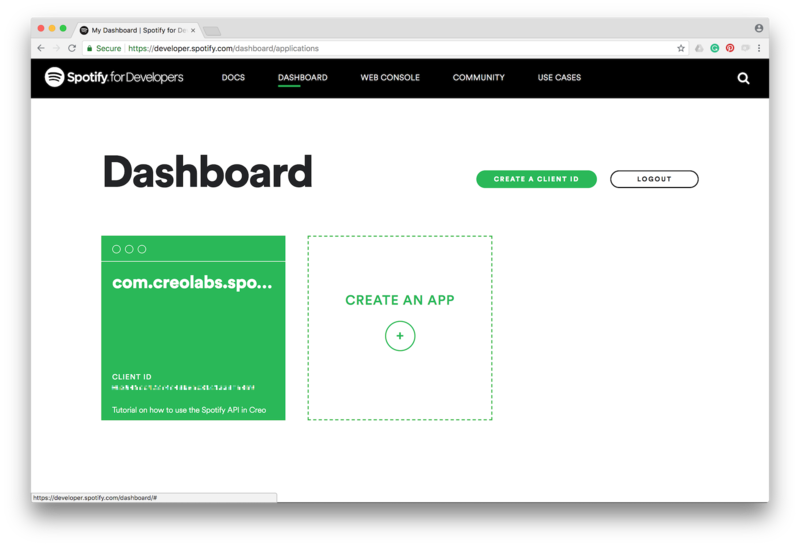 Creo is able to extract JSON query data while in design mode and display it inside your custom view. Let's add a way to query Spotify. Keyboard.hide() - Hide the keyboard after user has finished entering text. Spotify.Request.q = TextField1.text; - Set the parameter of q to match user input. Spotify.Request.run(); - Run the Spotify.Request method. 14 Press RUN and enjoy the Spotify app! ore.
You can now preview the app on your CreoPlayer or build it for the App Store. In the downloadable project you must create and enter your own OAUTH2 Authentication Info since OAUTH2 Client IDs & Secrets are login information for the API and cannot be shared.